There's nothing more symbolic of Chicago than its hot dog: Sears Tower, Wrigley Field, systemic political corruption, all take a back seat. There is no act more American than piling a bunch of delicious toppings onto a hot dog, and no place on earth takes its meat as seriously as the Windy City. The Chicago Dog, a beacon of neon green relish and yellow mustard, is not just our town's greatest contribution to culture of any kind, it both encapsulates how Chicago was built, and what makes this city great. The exact time and location the hot dog first took our veritable Republic by storm are unfortunately lost to memory, different cities and people claimed to have been the first to serve the modern hot dog on a bun, but its ancestral roots are clear. Before Hispanics, Italians, Jewish, or Polish, the country’s first mass immigrant group was from the fatherland of ground tubed meat, Germany. German immigrants had been a part of the US since before the revolution, though they didn't start flooding the nation until the 1840s. Displaced by political upheaval back home, Germans populated not only the farmland of the Midwest, but filled the burgeoning industrial cities as well. By the end of the 19th century, 25% of Chicago’s population was either born in Germany or first generation. As anyone who walked Taylor St in 1920s or Devon Ave today could tell you, food is an essential part of cultural identity. What we eat, how we eat it, and who we eat with will make up the backbone of daily life, and as immigrant groups attempt to survive and assimilate it is often their cuisine that sustains them. The Germans of Chicago were no different than any group that came after, they brought a taste of home along in the form of sausages, in particular the frankfurter, the skinny mixture of pork, beef, and spices from Vienna, godfather of the hot dog we love today. Americans of the 19th century were no less hungry than us for the newest food craze, and the frankfurter exploded across the country as a quick, cheap, and most importantly, delicious on-the-go meal. With their sausage skills in demand and a huge pool of cheap labor, Germans dominated Chicago's meat industry. In 1880 its estimated 36% of all butchers in the city were German immigrants and many more were of German origin. The frankfurters they brought with them were the perfect industrial food item. Chicago was the meatpacking capital of the world, butchering hogs and cattle from all over the Midwest, and thus was a leader in the industrialization of food. The introduction of steam-powered meat choppers allowed Chicago factories to turn less desirable meat trimmings, from their plants in the Union Stock Yards, into the affordable street food. 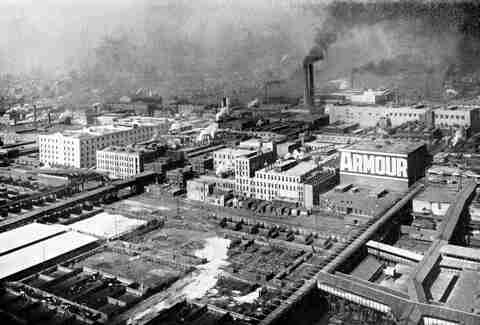 Chicago's oldest hot dog brand, David Berg, was founded in 1860, and national brands like Armour and Oscar Mayer soon followed. By the end of the century the mass produced frankfurter was commonplace, but there was one essential ingredient of the Chicago dog that had yet to take hold. It would take a second wave of immigration from Germany, this time Jewish, to introduce the all-beef hot dog. Coming from a poor socio-economic background, many Jewish immigrants took up jobs as street vendors and peddlers. 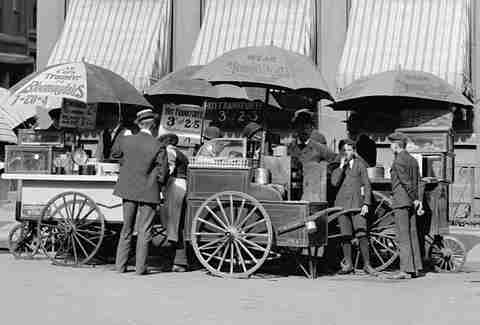 The hot dog cart itself became the lifeblood of immigrant communities. It was a low-barrier-to-entry job that allowed thousands of foreign entrepreneurs to support their families and make a living. In a time of foul health standards in the meatpacking industry the Jewish kosher tradition also had a reputation as producing food that was safer and more pure. The tastier, spicier all-beef version of the frankfurter took off and Jewish immigrants became the new kings of the Chicago hot dog game. 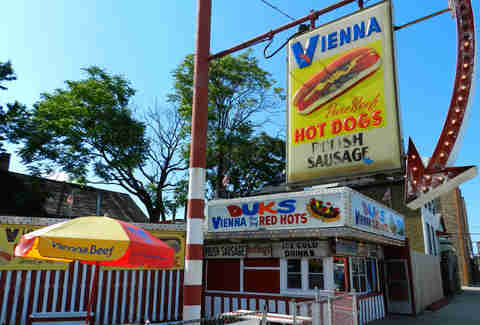 "To this day Vienna uses the original natural-casing, all-beef recipe developed by Jewish immigrants that gives the Chicago dog its distinctive flavor profile, snap, and texture." It was this wave of new Chicagoans that gave birth to our most beloved hot dog brand. Although they were not the first to sell the sausage, two Jewish immigrants from Austria-Hungary, Samuel Ladany and Emil Reichl, recognized the profitable potential of hot dogs and opened their own business. They made a big splash with their popular stand selling dogs on the street at the Columbian Exposition. They made so much money they used the proceeds to invest in a larger business and named it after the pinnacle of sausage cities, Vienna Beef. To this day Vienna uses the original natural-casing, all-beef recipe developed by Jewish immigrants that gives the Chicago dog its distinctive flavor profile, snap, and texture. The all-beef hot dog wasn’t just a hit, it was a phenomenon, the cylinder of ground meat became a symbol of American prosperity. The assembly line worker loved them as much as Babe Ruth loved them. It was affordable, it was filling, it was good, the American dream on a bun, and nobody downed them like Chicago. But the original sausage was only the foundation of our city’s great dish. Tastes were starting to change on the streets, as more immigrants from Eastern and Southern Europe filled the working-class neighborhoods. One such enterprising individual was Sam Rosen. A Polish-born immigrant Rosen had first moved to Germany to learn the art of baking. He first came to New York and opened a bakery at the unbelievable age of 16. Seeking better fortune only a few years later he came west to Chicago, buying a bakery and opening his eponymous business in 1909. It was a huge success, not only on the strength of its rye bread beloved by the Germans and Poles of Chicago, but as the originator of the poppy-seed bun. It was another essential ingredient in the Chicago dog, introduced by an upstart, enterprising immigrant, tailored to the tastes of a diverse city. By the 1920s Maxwell St on the West Side was the center of Chicago's immigrant community. 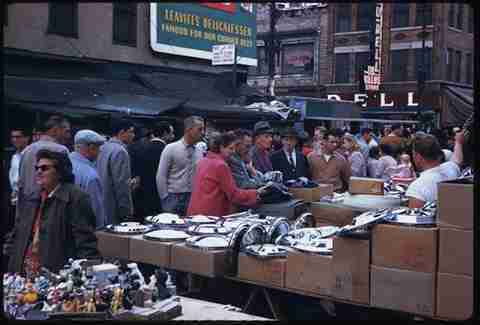 A bustling market where Jewish, Italian, Greek, and Polish traders would sell clothes, trinkets, and food. Hot dogs were the dominant meal for the busy cost-conscious crowds that would fill the streets hawking their wares. Many of these vendors also owned vegetable stands, and they began to experiment with a wide range of toppings plucked fresh from the market. Up until the '20s traditional German/Jewish toppings like mustard and pickles had been how someone would take their dog. Now, according to Hot Dog historian Bruce Kraig, vendors began adding their own spicy and sour flavor profiles -- from hot peppers, cabbage, and celery salt -- that appealed to the tastes of the new ethnic groups. The melting pot of western Chicago laid the groundwork for city's signature combination of toppings, but it would take the spark and desperation of the Great Depression to finally birth it. After the market crash in 1929 hot dogs went from a favorite cheap-eat to a necessity. Just as selling them has sustained generations of immigrants, eating hot dogs sustained out-of-work Americans. While other industries crumbled, hot dog vendors became even bigger community mainstays. The only problem was that even the lowly hot dog was often too expensive for such lean times. A down-on-his-luck former factory worker would often eat three or four to fill himself up. Things had to be stretched even more to make it both filling and affordable. Maxwell vendors, being the practical people that they were, started piling dogs high with the vegetables sold all around them to transform a single hot dog into a more filling and nutritious meal. The original Fluky's stand on Maxwell claimed to be the first, with its famous “depression sandwiches” that they sold for a nickel in the '30s, emblematic of how the ingenuity of small owners and the mixed immigrant community of western Chicago came together to shape the region's food culture. There were many different variations on being “dragged through the garden,” but it became apparent that the sacred combo of short peppers, mustard, pickle, relish, onion, tomato, and celery salt was the best of the bunch. The Chicago dog was born. The triumph of the Chicago dog doesn’t end with Maxwell St. It would take one last group of blue-collar entrepreneurs to turn the meal from depression lifesaver to citywide icon. As soldiers returned home from World War II they looked to a better life just like their immigrant fathers. Now second or third generation, they would carry the Chicago dog out from western Chicago to the rest of Cook County and beyond. "What was once a city of immigrants from all over the world was building its own culture, and their unique hot dog was at the center of that identity." In the boom of post-war America, the suburban land we know today finally took hold. What was once a privilege of rich commuters became the ideal of an entire nation, green lawns, wide-streets, and cars. As young couples moved to the new suburbs out of the old neighborhoods they carried an all-American love of hot dogs with them. The new communities were being built almost from scratch, huge swaths of countryside being eaten up by ranch houses and freeways. Unlike the established neighborhoods the Chicago dog was born in, there were no cultural centers, no historic landmarks and shared traditions. The neighborhood hot dog stand became one of the first institutions to fill that void. As German and Jewish immigrants found the hot dog stand to be an accessible and cheap business to make their living with, so did the working class families fleeing to the suburbs. Many of the Chicagoland's most enduring hot dog stands got their start in the '40s and '50s with the Chicago-style hot dog as their main (sometimes only) attraction. Gene's & Jude's has its origins in a hot dog stand on the west side at Polk and Western. After losing the original store Gene Mormino decided to set up shop in the suburb of River Grove, so undeveloped at the time the streets weren't even paved yet. Opening in 1950, Gene's & Jude’s has become an institution serving nothing but fries, tamales, and high quality minimalist dogs. The original Fluky’s itself migrated from the Maxwell St to the newly developed far North Side at Western & Pratt. The local hot dog stand became a gathering place, somewhere you could sit down or stand at a counter, and chat with a few friends over a cheap meal. Children walking home from school would stop by a stand and use pocket change to treat themselves. You would see friends or relatives when you popped by on the way home from work, or the owner would chat your ear off. 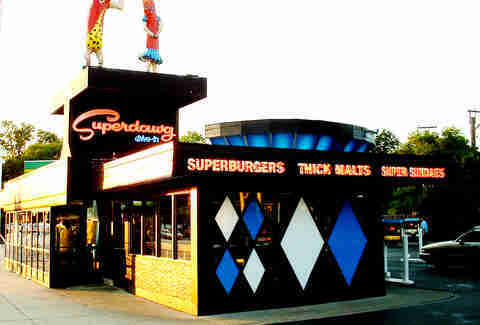 The 1950s also saw an explosion of roadside hot dog stands that catered to the new car-oriented culture. The first drive-ins touted the hot dog, easy to hold quick to eat, as the first roadside fast food. The new suburban America ingrained the hot dog as one of its first and most enduring cultural traditions. It was these local businesses that brought the Chicago dog as we know it all over the region, and it was their prominent place in the community that helped the Chicago dog endure for years after the depression. What had once been a way for Germans to stay connected to their roots became a way for people all over the city to bond. What was once a city of immigrants from all over the world was building its own culture, and their unique hot dog was at the center of that identity. There are reasons beyond its popularity that the hot dog has become a core part of Chicago's cultural identity. Affordable, industrial, blue-collar, unpretentious, it's the perfect food for the mecca of the Midwest. The hot dog came from Europe, was perfected in America, and satiated people building the nation. Regional hot dog variations reflect the values and tastes of a local culture. With its overloaded mess of toppings and wide variety of sweet, spicy, and sour tastes it appeals to a diverse city of hard-working everymen, a mixture of natives and immigrants proud of their practical, gratifying lifestyle. "The oft-mocked disdain for ketchup comes from the basic idea of doing simple things the right way." That's not to say the Chicago dog is merely quick and cheap, it is also really damn good. Our dogs are infused with a craft and concern for quality ingredients that lesser cities might dismiss when dealing with the lowly hot dog. We don't just use any old dog, it has to be natural-casing, all-beef, and spiced just right, a true aficionado will spot an imposter a mile away. The oft-mocked disdain for ketchup comes from the basic idea of doing simple things the right way. The overpowering sweetness of the dreaded condiment destroys the balance of the other toppings. Mustard, on the other hand, was made for sausages, a little sweet, a little spicy, just tangy enough to give it a kick, the distillation of the entire Chicago dog into one ingredient. Even the slight crunch of a poppy seed bun is essential. There are so few perfect things in the world, we know not to mess with them by dumbing down our standards. You can see the Chicago love for the hot dog in the persistence of our neighborhood hot dog stands. While fast-food chains and trendy foods crop up, local hot dog joints have endured. 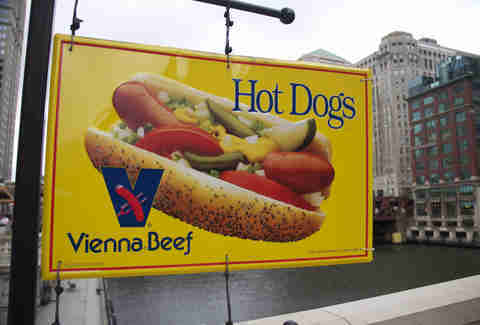 The sight of Vienna beef signs over greasy counter stores may as well be the city's postcard. We grow attached to the uncomplicated places that hold their ground next to new coffee shops and flashy bars. Like treasured historical landmarks they seem indispensable to who we are as Chicagoans. 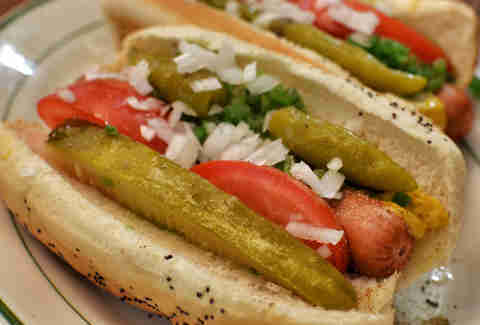 Straightforward, democratic, and damn good, the Chicago-style hot dog is the image we project to the world. Matt Spina is a writer living in Chicago who has been surviving off hot dogs for the last 10 years. Find out the next time he eats one @MR_spina.